There exists a normal body function that affects the education, health and well-being of women all over the world, due to persisting taboos and lack of access to adequate supplies. It’s something that even in America, we’re often uncomfortable talking about: menstruation. Even in 2016, most women in India do not use sanitary products for their periods. Instead, they use a variety of materials including newspapers and cow dung, which can have serious health implications. For example, 70% of all reproductive diseases in India are caused by poor menstrual hygiene, which is something that can be greatly reduced through education and supplies. But getting feminine products is often prevented by the social taboos that majorly affect the 355 million women of menstruation age in India. Some of the other consequences from the myths surrounding menstruation is that the women are sometimes considered impure and barred from temples, can be excluded from the community during the duration of their period or forbidden from drinking from the same water supply as the rest of the village. And in addition to the social taboos, the solution isn’t as simple as shipping pads and tampons to India. There are major issues of disposable non-biodegradable feminine hygiene products in India, as many of the items end up being flushed down the toilet, which blocks sewers systems, or end up contributing to India’s landfill problems. Why is this important? Because without the proper sanitary products, women’s lives are greatly impacted.It’s difficult for many women to gain access to these necessities and live their normal lives because of stigma surrounding menstruation. In some parts of Kenya, for instance, women who are menstruating are prevented from interacting with livestock, preparing meals or eating any animal products. In some communities in Nepal, the banishment of menstruating women, known as chhaupadi is a common practice. Once a month, these women are forced to live in makeshift huts and are forbidden from socializing or sharing food with their families. This practice is not only damaging to a woman’s emotional state, but very dangerous, as it leaves the women exposed to the elements and to abductions. Mothers are taken away from their children, and the women are subjected to physical and emotional abuse from spiritual leaders, who believe the women have been possessed by demons. Because of taboos like these and the lack of supplies, many girls are prevented from attending school while they have their period. 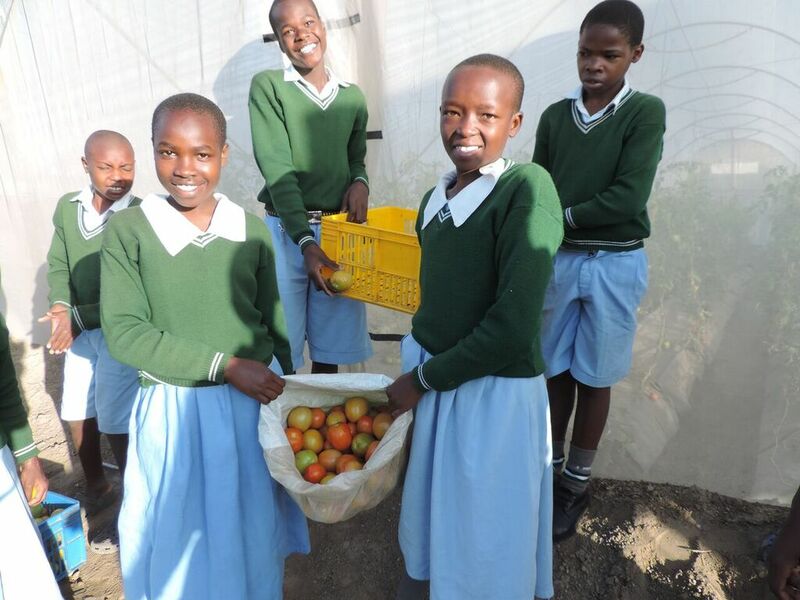 In Kenya, girls miss an average of 20 days of school per year, according to a Duke University study. This puts girls at a disadvantage to achieving education equality and dissuades communities from investing in the education of girls. Photo: Kitechild: School children at the Fiwagoh home, showing the harvest from our greenhouse project, that works to fund their education. As an organization that focuses on the quality of care and educational opportunities of vulnerable children in their communities, this is a huge concern for us. Education is pivotal to breaking the cycle of poverty. We work to raise the quality of life for vulnerable children, especially those living in orphanages. We know that poverty is the main contributing factor that leads to children living their lives in an orphanage. Most of these children have one or both living parents, but their families simply cannot support them financially. If we can break down the barriers that prevent children from getting their education, like obstacles related to menstruation, we can help people permanently rise out of poverty. By escaping the cycle of poverty, more families will be able to care for their children in their home, which is infinitely better for the well-being of all involved. One of the most important things we can do is to bring attention to this issue and not be afraid of having frank conversations about menstruation. Nancy Muller, of the NGO Path, sees the fear of discussion as a major obstacle to helping these vulnerable women and girls. “People prefer not to think about it or talk about it. It’s a challenge to secure funding because menstruation is not seen as a critical or life-threatening issue,” said Muller. Even in America, there is a lot of work to be done for the accessibility of sanitary products, but luckily, progress is being made. Chicago just banned the tax on tampons and pads, by a unanimous vote. And the New York Assembly has just passed Linda Rosenthal’s legislation to exempt feminine hygiene products from state sales taxes. Rosenthal calls taxes like this, “a regressive tax on women and their bodies.” Activists in Canada have also been successful in getting their government to repeal taxes on pads and tampons. It seems that more and more states and countries are waking up to the importance of accessibility to sanitary products… and as we keep bringing attention to women’s health issues, things can only improve for women and girls everywhere.